We’ve got a party on the run from the reality of a bill it just passed. But Democrats shouldn’t rest easy. Sunday marked the second anniversary of the glorious day that then-presidential candidate Donald Trump promised Americans he wouldn’t cut Social Security, Medicare—or even Medicaid. That’s Republican heresy, especially the last part. Analyst after analyst who wanted to see economic anxiety, not just racial, ethnic, and cultural tribalism, behind Trump’s appeal put that promise forth as one key to his popularity among white working-class voters, who helped give him his Electoral College wins in Pennsylvania, Michigan, and Wisconsin. GOP leaders celebrated the second anniversary of Trump’s lie to his base voters by lying their way through the Sunday shows about Trumpcare. And why not? They’re taking a page from their president, believing they can hide the cruelties of their bill behind platitudes, self-righteousness, and outright misrepresentation. Still, while it’s satisfying to mock their lies, progressives also need to realize: We thought this bill was dead weeks ago. We didn’t stop it. It’s now going to the Senate, where we were sure, weeks ago, they’d stop any bad thing the House passed. Now that’s not so certain. I think we need to update our assumptions. Republicans are lying so flagrantly because they know they’re doing something awful, and it looks that way even to their own voters. But we also have to realize: Somehow they’ve managed to shift the political dynamics from “My constituents will punish me if I take away their health care” to “My constituents will punish me if I break my promise to repeal Obamacare.” That’s why the GOP wants to lie, and claim the bill won’t take away anyone’s health care. The media is already covering it poorly; let’s hope we can change that. But this is a dangerous shift. This is what moral people call a “lie,” Paul Ryan. The $8 billion the bill added for states who choose to let insurance companies opt out of their duty to cover people with preexisting conditions—to create the sorts of high-risk pools that failed in most states, and led to the passage of Obamacare—is a fraction of what full, affordable coverage would require. 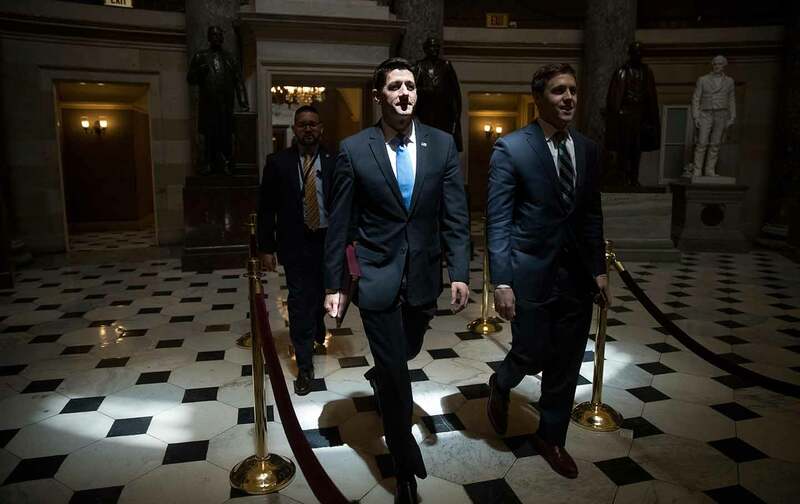 Ryan also huffed about the “bogus attack from the left,” complaining that the House hadn’t waited for the Congressional Budget Office to lay out the impact of the new bill. He claimed it only represented minor changes to the one already scored by the CBO. That’s not really true: The CBO will also presumably tell us whether the added $8 billion is enough to cover everyone with preexisting conditions, and more about the other “minor” changes to the bill that passed. No wonder Ryan couldn’t wait. On Meet the Press, Health and Human Services Secretary Tom Price echoed Ryan in claiming that the bill’s critics—which include every major medical group and the AARP, as well as every sentient organization on the left—don’t understand that “this is a different and we believe better way” to cover everyone with preexisting conditions. But he didn’t take the time to explain how. Because he can’t. Meanwhile, on Fox News Sunday, White House Chief of Staff Reince Priebus delivered this innovative claim about the bill’s provision that lets governors waive the federal requirement to include people with preexisting conditions in the general insurance pool: “It doesn’t affect anyone with continuous coverage, even if a governor—which I’m not sure that’s ever going to happen—takes the waiver option,” Priebus said. Congratulations, Reince. Because that’s such a convoluted lie—unlike your colleagues’ simpler ones—I’ve got to unpack it a little. Of course, thinking people know the likeliest scenario for losing coverage is this: “I just got laid off, and now I have no health insurance.” Almost nobody, especially among those with troubled health histories, is “choosing” to lose their “continuous coverage.” Also: Acting like red-state governors won’t seek these waivers is dishonest—why are they delivering them, if no one will use them? Finally, a few more howlers: from OMB director Mick Mulvaney, a former Freedom Caucus leader: “Everyone will have coverage that’s better than Obamacare” under Trumpcare. And then there’s current Freedom Caucus member Representative Raul Labrador of Idaho, who told a town-hall gathering (to jeers), “Nobody has died because they didn’t have access to health care.” I don’t even need to try to refute that; his constituents are doing so ably. He issued a “clarification” so dishonest I won’t include it here. It makes all these other lies pale in comparison. So we’ve got a party on the run from the reality of a bill it just passed. Democrats should feel pretty good, huh? The problem is, I don’t. Donald Trump has taught Republicans that you can lie your way through anything. The Senate, which many trusted to defang this bill and pass a compromise plan too moderate for House conservatives, isn’t guaranteed to do so. For one thing, they established a working group of 13 men—even though there are five female GOP senators—which indicates they’re trying to circle the wagons and not invite new ideas. Senators Susan Collins and Lisa Murkowski, for instance, oppose the bill’s defunding of Planned Parenthood. For another thing, even senators who’ve criticized the House bills, old and new, are now singing from the brand-new GOP hymnal. Last month Senator John McCain told The Arizona Republic: “We cannot abandon any group of Americans who have become accustomed to receiving health care. The question is how do you maintain it as affordable.” But this weekend he told reporters he’d promised the voters of Arizona he’d help repeal Obamacare, and he seemed less implacably opposed than he was last time around. Democrats need to understand that, for Republicans ranging from Trump critics like McCain to faux Trump critics like the conscience-free Paul Ryan, this is the new rationale. I have no doubt the Resistance can beat this bill back, too, but not if we all assume the GOP is more afraid of us than of their farthest-right supporters—and of course, their donors. We slept a little on the House bill; let’s wake up as we look at the Senate’s.